Caption slip reads: "Daily. Photographer: Richardson. Date: 1953-09-14. Reporter: Swaim. Assignment: New judge, Pasadena. K1-2: H. Burton Noble, 50, Pasadena Municipal judge appointed to Superior Court. 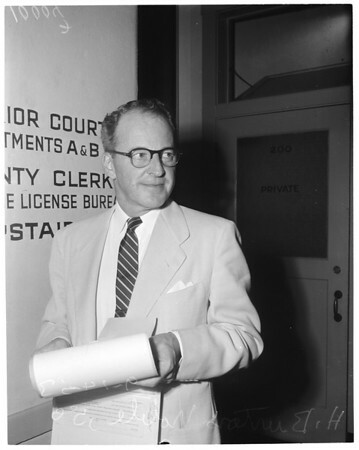 K91-92: Municipal Judge H. Burton Noble being congratulated by Ardeth Seymour, court clerk, on his appointment to Superior Court."